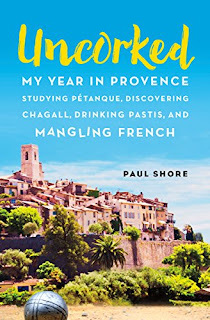 In the midst of my moving preparation, I found the time to read a relatively short memoir about a Canadian man who moved to Saint Paul de Vence to work in IT. 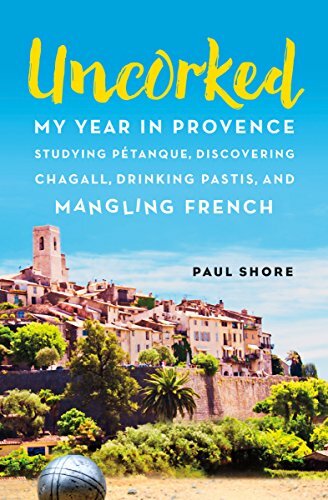 The book is called Uncorked: My Year in Provence Studying Pétanque , Discovering Chagall, Drinking Pastis, and Mangling French. He tells the story of how he fell in love with game of pétanque and convinced a local man to teach him to play in the dark of night. Eventually, the man embraced him as a partner, and he became one of the locals playing pétanque by the cafe and ignoring tourists. This was an entertaining book because it addressed a topic that is oftentimes touched upon in books but rarely focused on. Of course, the game wasn't the entire point. The game helped him integrate into the village. And since we are planning to move to France, we always wonder how we'll worm our way into local life. Earl pictures himself sitting on a bench watching pétanque and eventually being allowed to play with the other old men in the village. I think I'd better get him a coach. The French word bisou is used to describe the charming manner in which the French greet one another with a ceremonial kiss on both cheeks. This act should not be mistaken for a sign of real affection or even friendship but rather as a refreshingly warm way of saying hello or goodbye. 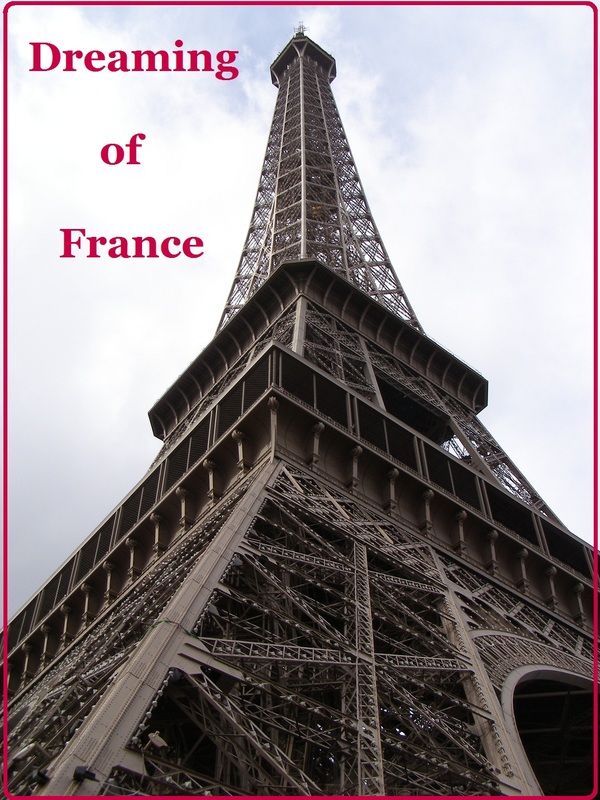 As tourists in France, we foreigners have all been witness to these tiny gifts, but rarely do we gain admittance into the tightknit club of the 60 million or so people who exchange them.... Receiving and delivering countless bisous during my year in the magical Cote d'Azur village of Saint-Paul de Vence made me feel a sense of "limited belonging," but when my neighbor, friend, and, most importantly, pétanque coach, Hubert bid me farewell by initiating a bisou, after my last match and last pastis as a local, it gave me pause to reflect on how close I had become to this part of the world, its people, its culture, and the game I fell in love with the minute I first laid eyes on it: pétanque! I loaned the book to Earl on Kindle so he can read it too. Hope it doesn't make him fear playing pétanque in France. It's mean to encourage him. How about you? Have you ever played pétanque or boules as it is called in other parts of France? What about receiving or giving a bisou? Have you experienced that? I'd love it if you shared your experience. Thanks so much for playing along with Dreaming of France. Please leave your link below and visit each other's blogs to share your love for France. So, we're a week into selling the house, and I realized this morning, as I was standing in the shower, that I needed to soften my face. Relax! I chided myself. I have to actually focus on it to stop that scrunched up feeling in the middle around my eyes, nose and mouth. We had to vacate the house at 9 this morning for a showing, and there is another open house this afternoon. We practically can't live in our house. Our real estate agent had talked up the hot market. 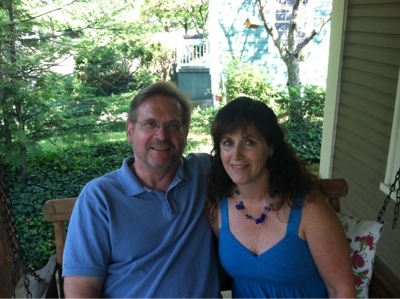 She said we would probably be in contract before the first open house last Sunday. We aren't; thus, the scrunched up worry face. What's wrong with our house? Is our price too high? Can we pay off all our bills and buy a house in France at a lower price? All of these questions constantly swirl around my brain, preventing me from enjoying the sun-kissed day and heavenly breeze. I had a brief run Saturday morning before I had to teach, and I know that I need more of that - running time. Meanwhile, Earl and I carried our laptops to Panera this morning and settled in for breakfast and some screen time. We had talked about driving to my brother's house about 90 minutes away and staying through the open house. I know I would have enjoyed seeing him and my sister-in-law, but the thought of driving back home in the evening, more exhausted than ever, made us cancel that plan. In addition to the carefully staged setting at home, we have some more turmoil coming our way. Tucker is moving out of his apartment to a new one, but he has to have his things out on Monday and can't move in until Tuesday. He's going to use our garage as the receptacle overnight for all of his belongings. He may or may not sleep at our house that one night of homelessness. But Spencer, who has been living with Tucker for the past month, will be moving back home. I'm sure it's not what he wants, but until he has a steady job and a bit of money saved up, he'll have a place to sleep and plenty of food. I urged him to take his time and find a job he likes rather than jumping from sales job to sales job that he doesn't like. He's delivering food for Panera where he will get immediate tips for his everyday needs while he continues to look for a job with a good salary and benefits. Grace continues her job search. She's receiving unemployment, so she can take her time, as well. It seems like we have very few stable supports in our family right now. Yesterday while I was teaching, Tucker texted to ask where everyone was. He had dropped by the house to do laundry. Then when Earl got home after the morning showing, he said Spencer had shown up. I ordered pizza and picked it up on the way home, along with texting Grace that she should come over for pizza. She wanted to do laundry too. Me taking a selfie with the pizzas, reminding the kids I was alone and hungry. When I got home, everyone but Earl had left. I texted the kids and soon they each pulled up and joined me on the patio for pizza and a rare family lunch as the breeze ruffled the umbrella over the table and the cats rubbed against the chair legs, not wanting pizza, but just some attention. And for a moment, I looked up and remembered how lucky I am. It's a little pale, but we did see a rainbow last week, which surely is a sign. Most readers know that we have been prepping the house to put it on the market, and we finally got it ready last weekend. We've had several showings and one offer that we didn't accept. A couple of other offers are in the pipeline, so we are trying to be zen about it. But as I worked to ready the house, I found myself becoming accident prone. Some bruises make sense as I hauled furniture out of the basement, into a truck and then into a storage unit, or someone else's house. Earl's nephew agreed to take the upright piano that we have had since Grace was 1. Earl's mother had originally purchased the piano and it was covered in black lacquer. She stripped the wood and finished it so that the wood grain shone through. The piano movers. Tucker is kneeling with his back to the camera. Earl and his nephew are standing behind the piano, and Earl's brother is using a lever to get the piano on a dolly. We did love it, but no one played it anymore, probably since we moved to this house, about 10 years ago. I used to play the piano quite frequently, but in the move, I lost all of my favorite piano books and couldn't get motivated to start over again with learning various pieces. As you can see, we had more help moving the piano, so I didn't hurt myself. But many times as we are carrying furniture out, it's only me and Earl or me and Spencer. Spencer has admitted that I'm a pretty good mover for a girl -- I didn't take that as an insult, because I know that my physical strength is definitely limited, yet I'm willing to try to move heavy things, like this desk that needed to be out of the house at the last minute before pictures were taken. Of course, I first had to clear everything off the desk. And Tybs at that moment decided that the desk was his favorite place in the world and we couldn't possibly move it out. So many times I hit my shins as I'm walking forward carrying a piece of furniture, or the furniture hits me, leaving bruises, as I walk backward with it. I also have big bruises on my forearms, I suppose from lifting and holding items. Then two weeks ago, I had that fall on my back porch as I tripped after walking five miles. The bruise from that fall has faded to a pale green that stretches from my knee toward my ankle. I stopped running after that fall, giving my knee time to heal. But last week, I stepped on a sliver of glass that came from a broken picture frame. I'm awful at getting splinters taken out of my feet. I decided to avoid walking on it that night and I tried to tackle it the next morning. I soaked my foot in hot water to loosen it up. I used a credit card to try to scrape it out. Then I used tweezers but couldn't get a hold on it. Finally, I decided that I would let my body absorb it or spit it out. I only felt occasional twinges when I stepped down on a certain part of my foot. Obviously, I couldn't run with a splinter of glass in my foot. On Sunday, before the open house, we decided to clean the side windows again because it had been raining. The windows are old and have a series of storm windows and screens. Earl was outside on a ladder and I was moving the storm windows up and down. One of the windows didn't want to go all the way up, so I was reaching under it to get to the storm window, when the window suddenly released, like a guillotine, streaking toward the closed position, and it landed on the heel of my thumb as I tried to escape it. The impact formed a purple/red ridge along the heel of my thumb as I sprang away in pain. The swelling has subsided, but it is still sensitive to the touch and the dark bruise is slowly spreading. I wonder if the stress of preparing the house to move has made me more prone to injuries. Maybe I'm being more careless, focused on the end result rather than taking my time. Now that the house is on the market, I'll use this lull to heal, letting my bruises fade. Once we have a contract and a determined move out date, I'm sure I'll be back to moving mode and receiving new bruises as I race to get rid of our belongings that won't be coming along on our trip to France. We are big cat lovers at our house, so even when we are traveling, we are on the lookout for cute cats. There was no shortage of them in France. This stocky gray fellow on the wall was in Mireval, not too far from Montpelier, where we stayed as we explored part of Languedoc-Roussillon. One day I explored in Mireval and found another bakery. I also found this black and white cat near the church. This guy was giving himself a bath with a nice view of red roof tiles. And this chunky cat safely peered out over the world from the safety of his balcony. Here's a cafe cat from Quillan, which is where we stayed the second half of our trip. This cat was laying in a courtyard in Caunes-Minervois, a place where I now know that I should have eaten at the hotel. And here's another cat in Caunes-Minervois, pretending he's in the jungle and that we can't see him. I'm sure I have more France cat pictures, but I'll save them for another day now that I'm home with my own cats. hank you for joining this weekly meme. Grab a copy of the photo above and link back to An Accidental Blog. Share with the rest of us your passion for France. 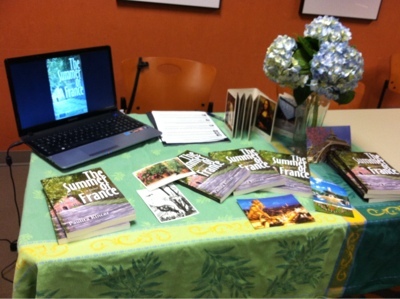 Did you read a good book set in France? See a movie? Take a photo in France? Have an adventure? Eat a fabulous meal or even just a pastry? Or if you're in France now, go ahead and lord it over the rest of us. We can take it. Surely, I must be dreaming of France to get through all of the cleaning and boxing and storing that I am doing. If France was not dangled at the end as the prize, I would never make it. So here's a picture of me in Jardin du Luxembourg, literally dreaming in France. This was on our last morning in France. Some planter palm trees in the Luxembourg gardens. We watched an exercise class (would I ever be brave enough to join in, in Paris?) and then we sat near the pond and watched children play and people pass by..
Guys, I'm writing to you all today like a diary, a chance to pour out my fears. My eyes popped open suddenly last night, boring into the darkness. But the darkness was broken by flashes of lightning and a loud boom that could have been thunder or the tree at the corner that fell during the night. My mind didn't care which. It began racing. Was the house really going on the market in a week? Were we going to leave behind the house we bought 10 years ago, where the children attended school, where Earl and I walked to dance class, where I trudged most days to the coffee shop with my computer bag slung over my arm so that I could tap out books that inevitably focused on my longing for France? But while I was longing for France, did I forget to find the joy of everyday life in my little burg? If we sell our house here, the number one school district in central Ohio, we will never be able to afford a house here again. We hope to sell the house for an amount we couldn't afford now. 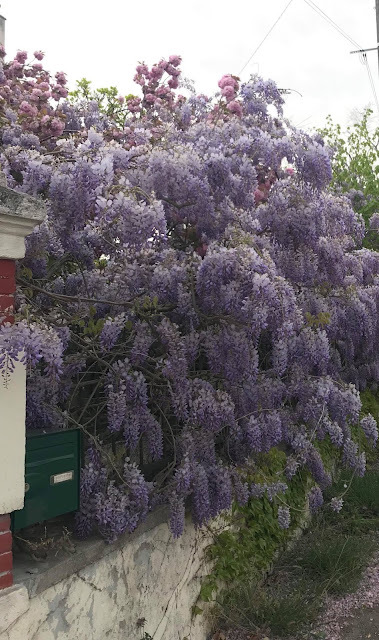 I spent some time today trying to figure out how we could keep the house even if Earl retires, and we might be able to, but we would sacrifice that other thing we've been wanting to do -- moving to France, traveling, exploring, having adventures. We could stay here, and I could add an extra job to the two teaching jobs I already have. I could convince Grace and Jack to move into the refinished basement where they would only need to share the kitchen upstairs. But that would mean giving up our dream. Earl would be free to write and travel and explore, but not with me because I would be working more hours. Perhaps if we had a place to move to then it wouldn't be so scary. We've sold houses before, but we always knew where we were moving afterwards, had a warm home waiting for us, but not this time. Our plan is to stay in Ohio until December when Earl will retire, yet we have no place to move too if the house does sell. Apparently, homes are selling within hours of going on the market. That would still give us a month or so to find some place to live for the remaining three months, but the pressure has begun to build. And then when we go to France, we don't have a house purchased. We thought we'd rent for a few months in different places to figure out where we want to live, but our we endangering our security, our future, by not owning property? If I share my doubts with Earl, rather than the two of us talking it out, he's quick to come down on a black or white side. "Forget it, we won't go," or, "don't be ridiculous, of course, we're going" when I just need to bounce ideas around. And when he tells people we are moving to France, he still says that it is my dream. I thought it was our dream now, but if it's only me then should we be going? On top of all the tumultuous thoughts, I fell this morning on the last step of our concrete porch, landing on my left knee and my telephone. The screen cracked on my phone. The bone under my knee, that one that kind of sticks out, is really sticking out now and has turned purple. It swelled up like a bump on someone's head. That just gives me an excuse to sit in a recliner and give all the confusing thoughts in my head a chance to run amok. Do I take the plunge, take a chance, selling the house and travel around France and other European destinations? Or should we play it safe and find a way to hold onto our little, but expensive, house? This is one of my favorite pictures from our most recent trip to France. My friend Leah is an artist and she tells me that I should take pictures of the things the sun is lighting up, but I keep being drawn to pictures with the sun. The sun had dipped low in the sky, but darkness was still a long way off, so it probably wasn't technically twilight. The pyramid and fountain outside of the Louvre. I'm on the home stretch of finishing all the preparations on the house. Hopefully after next week once we have the house on the market, I'll have more time to devote to blogging. 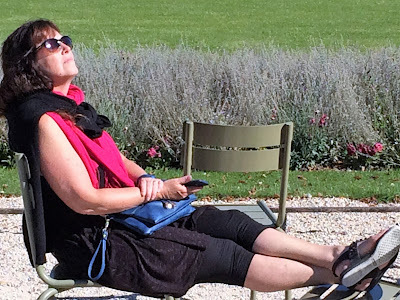 I almost took the day off today as we're coming into the home stretch of prepping the house for sale, but I thought I could at least put up a picture, to remind you all that I'm still dreaming of France, which is why I'm getting the house for sale. Soon, I'll be free to move to France. The golden light, the dark blue sky, the French flag. This was a shot that I took as we walked home one night.